I've been encountering a problem with OneDrive for Business in Office 2016 (part of Office 365) that claims that Office 2013 is installed when in fact it might not be! This even sometimes happens on fresh Windows 10 installations that have nothing on them yet! The solution is easier than you think, you just have to perform the following steps in order. First you need to remove anything related to Office on the computer. Just go to add/remove programs and remove things like "Office 365 Pro plus", "OneDrive", "My Office" or any other programs that are in the Office suite. In my case a Dell computer came pre-loaded with Office on it that I had to fully remove first. After you have removed all Office applications, you want to install just the OneDrive for Business 2016 client. You can get it by logging into your business account at https://portal.office.com and then going to OneDrive, then click "Sync" near the top menu. Then click "Get the OneDrive app that's right for me". That should link you to this page that lets you choose how to fix it. I used the "Let us fix this for you" under Office 2016 to install. Now that we have OneDrive for Business installed, we can go ahead and install Office 2016/365 as we normally would through the online portal. To hear about how RDAIT can help your business with Office 365 or other IT problems you might be having, give us a call today or use the contact form on the right! 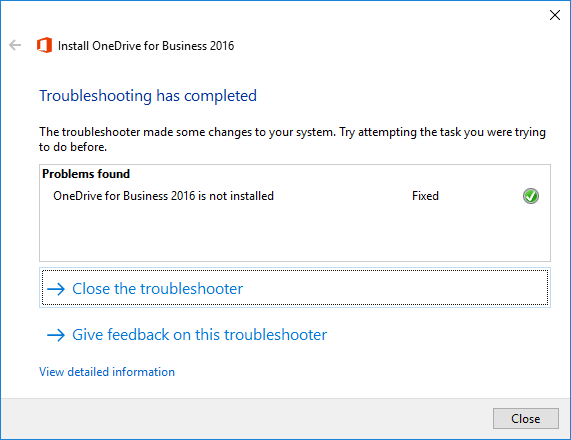 OneDrive for Business 2016 won't install because Office 2013 is installed?